Spring is in the air and it brings along the sweet thoughts of sugaring offs and delicious maple syrup. For many, their year is spent waiting for this one season where sap rises and maple trees are in bloom. This occasion is mainly celebrated in parts of North America and Canada where maple trees are in abundance, where families are given a reason to get together and celebrate the beauty of the nature surrounding them and sugar shacks are jam-packed and doing great with business. Whether it’s in the form of maple syrup or by the hearty traditional meals served, maple can be seen everywhere. It’s a smart idea for sugar shack owners to invest in wholesale cutting boards around this time of the year, made of high-quality maple wood and providing an excellent surface for both preparing and serving your dishes. You can even display them as a centrepiece or wall decoration to create a spring-like atmosphere. Not only will your clients have the idea of maple in their mind, they will also be more willing to purchase a maple product before leaving. Why Choose Maple Over Other Types of Woods? It’s true that spring brings out everyone’s love of everything maple, from cutting boards to syrup, yet this alone isn’t reason enough for us to drop all other wood types. If you are a believer in quality over quantity, you would understand how maple wood ranks superior to other wood types such as bamboo. While lower quality woods may be more readily available, they stand nowhere near maple wood when it comes to quality and longevity. Another selling point would be that the naturally occurring, unpredictable patterns in maple wood give it an unmatched beauty. These grains add elegance to the cutting boards, floors, furniture, musical instruments and anything else it is used for. It would be unfair to count the benefits of maple without even mentioning the process of a sugaring off. 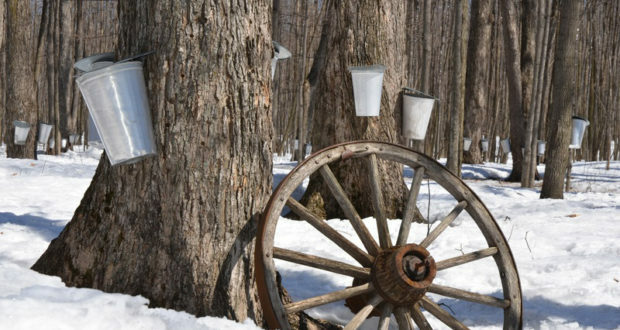 This is a yearly ceremony at which sap is collected from the maple trees and made into delicious maple syrup. A sugaring off is all about celebrating the appreciation and love for maple. There are a number of tree species, such as black maple, silver maple and boxelder maple, which produce different varieties of sap and offer different levels of sweetness. Make sure your sugar shack shows the appreciation towards maple that everyone will be looking for! From the syrup to the very boards being served on, if you show that your business adores every aspect of maple, your clients will start feeling the same way in no time. Visit Wholesale Cutting Boards and choose from one of their various maple models and get your clients falling in love with this annual tradition all over again!